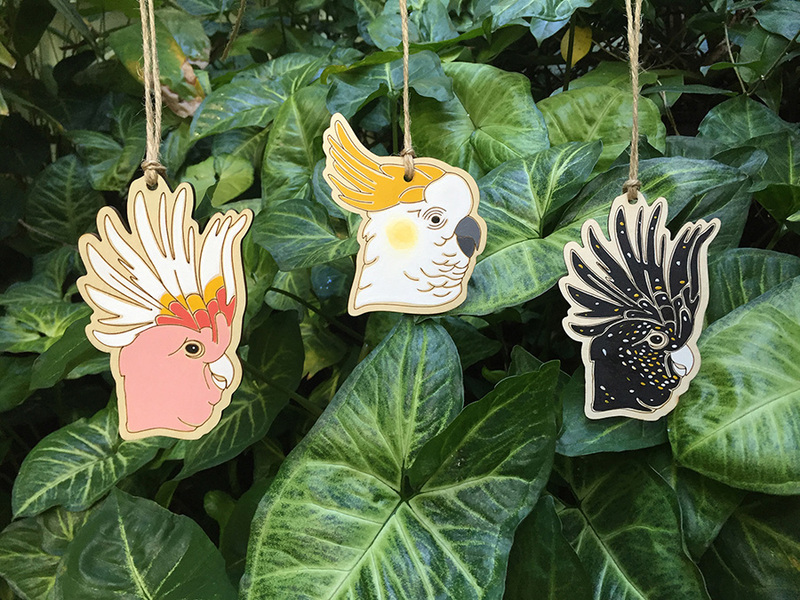 image features Cockatoo Ornaments Pack – Designed by Outer Island and made locally in Sydney. Souvenirs from Planet Earth! We love that Outer Island’s mission is to bring awareness to the magic of this world by creating products that focus on native plants, animals and habitats. Amy and Stephanie are passionate about this planet and are avid birdwatchers, snorkelers and bush walkers who love to travel and love to collect. Read more about their great little label below, and catch them at our Sydney market, next week! We love traveling, collecting and being in nature. I’m from New York and Amy is from Australia so we joke that we’re both from islands, which is where the name Outer Island comes from, but really what connects us is our love for collecting and making things. Last year we moved to Sydney from Brooklyn, but just before this we took a trip to the Redwood Forests of Northern California. We felt so inspired there and never wanted to leave, but had a hard time finding souvenirs we liked. So during a hike through an old mining canyon covered in giant ferns, we decided to collaborate on creating unique souvenirs. Amy is a graphic designer and I’m an artist. But we didn’t get the ball rolling until last October before our first Aussie Christmas together. After thinking about how we might collaborate, we decided to start with ornaments since we have our own collection and found it difficult to find unique and well designed Aussie ornaments to add to it. We wanted to bring the magic of Australian nature to our own Christmas tree. 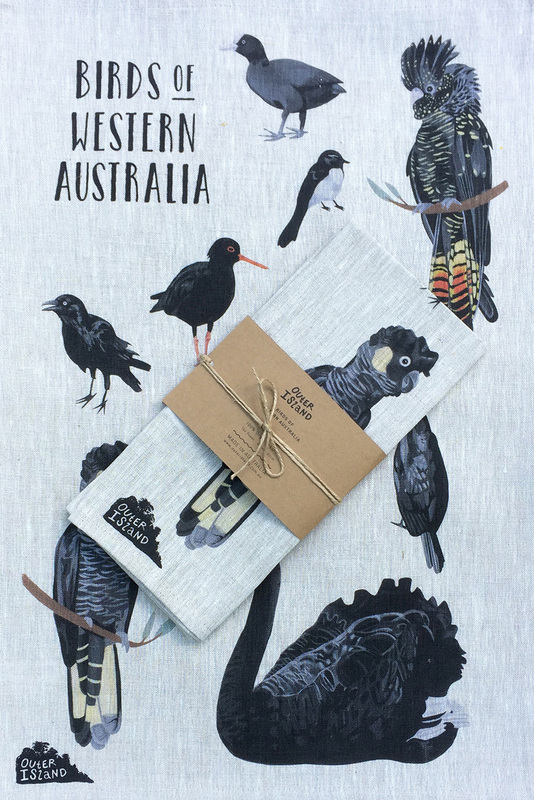 image features Birds of Western Australia Tea towel – Designed by Outer Island and Printed & made in Melbourne. 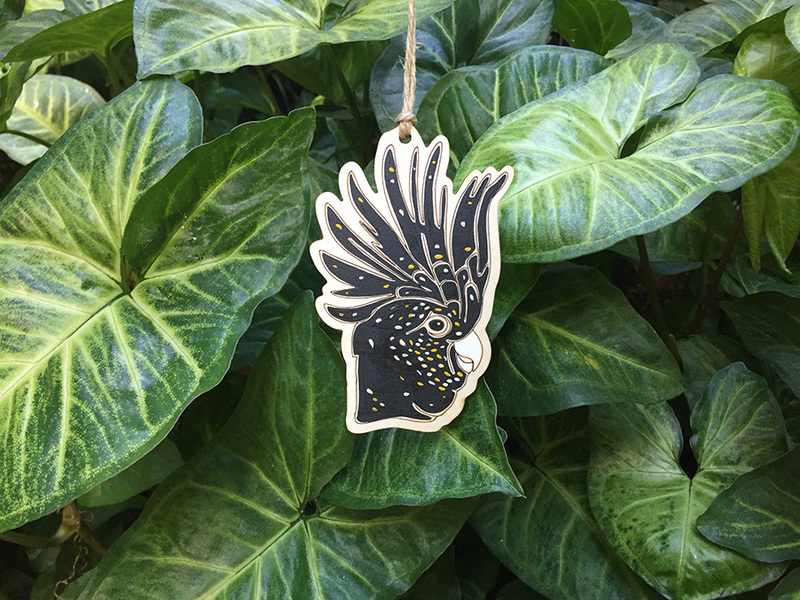 image features Banksian Cockatoo Ornament – Designed by Outer Island and made locally in Sydney. We’re lucky to live in sun filled Sydney and draw inspiration from the many exciting things we see in nature here. Our mission is to bring awareness to the magic of this world by creating products that focus on native plants, animals and habitats. We’re avid birders, snorkelers and bush walkers who love to travel and love to collect. We focus on making souvenirs about what we feel is the best part of any trip – the environment and the plants and animals that create it. We’ve also started our own bird group called Sydney Bird Club to share our love of bird watching. Our bush meet-ups are a source of endless inspiration as well. Tell us something exciting that you have planned for Outer Island this year. This year we’re going deeper under water! Amy’s getting certified in diving and we’re planning a trip to swim with whale sharks. I’m also working on my bird numbers. There are many different levels a birder can measure their passion for birds against, but in Australia, one of the top accomplishments is becoming part of the 700 club by seeing 700 different kinds of birds. I am a loooong way off, as in many, many years, but working toward it. We’ll also have some new products inspired by these adventures later in the year, including lots of new ornaments. 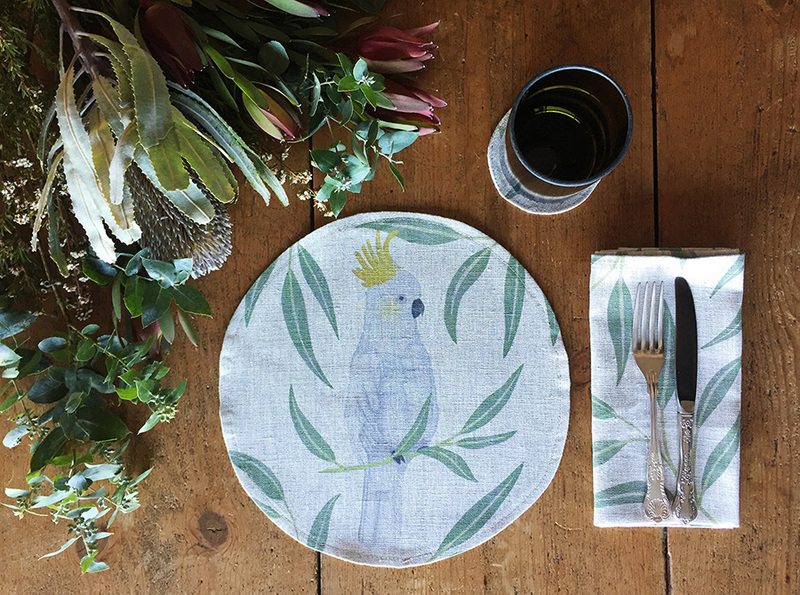 image features Sulphur Crested Cockatoo round linen placemat and tea towel – Designed by Outer Island and Printed & made in Melbourne. 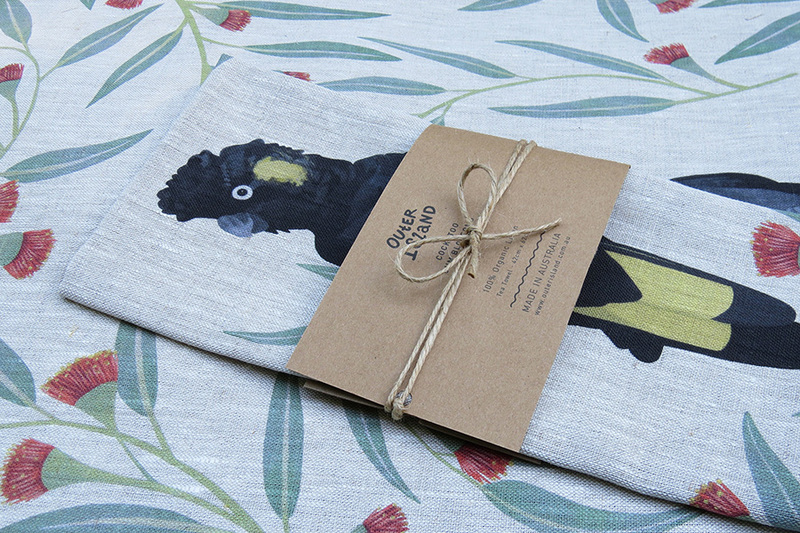 image features Cockatoo tea towel – Designed by Outer Island and Printed & made in Melbourne. 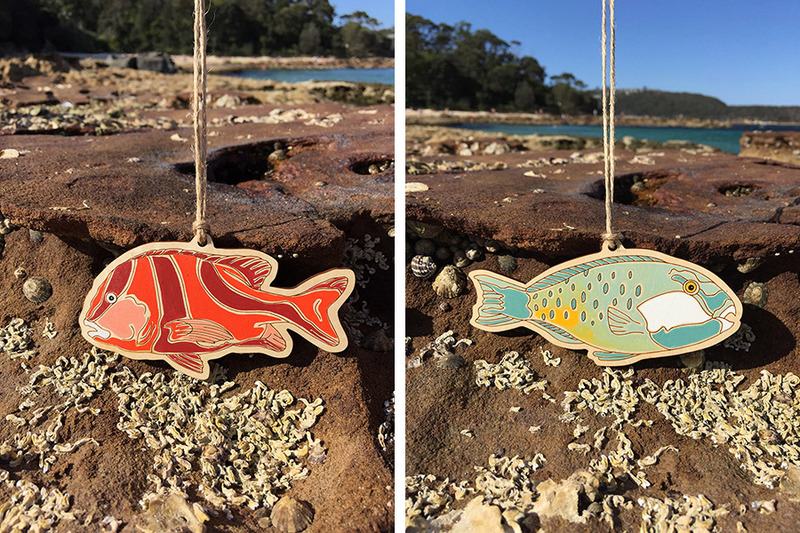 image features Emperor Red Snapper and Greenfin Parrotfish Ornaments – Designed by Outer Island and made locally in Sydney. Since we draw our inspiration directly from nature and our travels, we couldn’t live without the gear that let’s us experience it firsthand. On bushwalks that includes good sneakers, a camera, notepads, hats and snacks. In the water it includes our snorkel gear, underwater camera, rash guards and snacks again. So I think the answer is snacks! Amy and I are very different from each other which is what makes us work as both a couple and as collaborators, so we have different answers on this one. Amy’s is the round linen placemat from the long lunch collection. She had been looking for a smaller placemat for a long time and when we starting getting fabric printed, she decided to design one. It’s just a little larger than a plate, so it doesn’t take over the whole table which is why she likes it so much. And my favourite is the sulphur crested cockatoo ornament. I really love Christmas and bird watching so for me it’s the perfect combination. 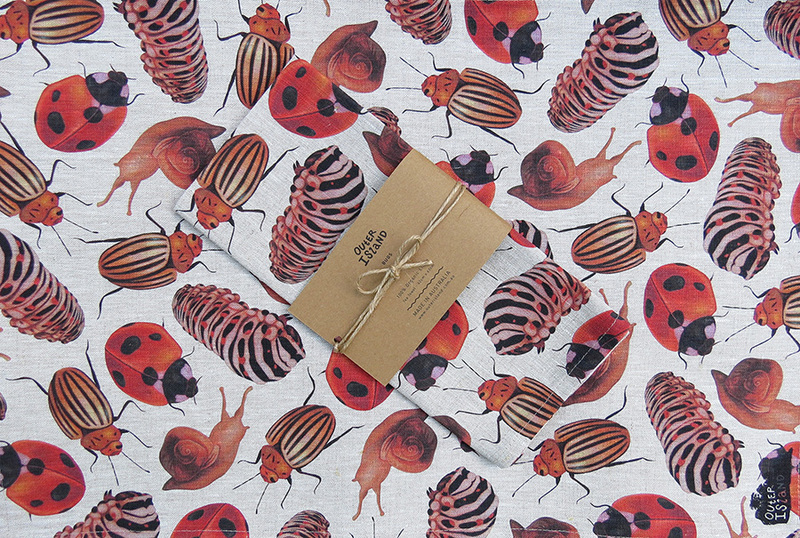 image features Forest Floor Tea Towel – Designed by Outer Island and Printed & made in Melbourne.